Jennifer Keesmaat Chief Planner, City of Toronto Toronto has much to share with Auckland and Jennifer will outline some of the city’s success stories and current programmes to deal with the shared challenges of rapid population growth, urban redevelopment and renewal, transport choice, housing affordability and community change. 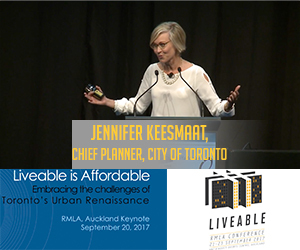 As the recently engaged Chief Planner for the City of Toronto, Jennifer is committed to creating places where people flourish. Over the past decade Jennifer has been repeatedly recognised by the Canadian Institute of Planners, OPPI, the Design Exchange, + EDRA for her innovative work in Canadian municipalities. Jennifer is a Registered Professional Planner (RPP) with the Canadian Institute of Planners, and qualified to give evidence at the OM with an expertise in Urban Design. She is also the founder of Project Walk which premiered its first short film in 2011 as an official selection at the TIFF and Jennifer debuted her first TED talk Walk to School and in 2013 she delivered her second, Own Your City. Jennifer Keesmaat is brought to you by Boffa Miskell and Auckland Conversations.